Phan's Mysterious Months in India Revealed Multi-talented IAHHS yoga, Thai Massage and Siam Reiki Master teacher, Phan, recently spent 2 months in India to further develop her yoga teaching skills. Here she shares with us some of her experiences and how she'll be enhancing her work as a yoga teacher as a result of knowledge gained from her trip. First off Phan let's find out about your background in yoga. For how long have you been practicing yoga, and how was it that you came to be a yoga teacher? I started practising yoga in 2005, but it wasn’t until 2008 when I had the opportunity to practice with a teacher from Belgium that I began taking it more seriously, and it was from this point that yoga came to be an important part of my life. At first I was just practicing for myself and never gave much thought to becoming a yoga teacher, then about 5 years ago a situation arose ‘by accident’ for me to teach some students, and I came to realize that a teacher is not only the person who leads the class and knows the asanas, but also has a much deeper knowledge and understanding about the essentials of yoga, and so I felt inspired to deepen and develop my own knowledge. You’re also a Siam Reiki Master Teacher. Tell us a little about the connection you find between Reiki and yoga. Both Reiki and Yoga are self-development methods. The aim of yoga is to connect with the Higher Self/higher energy through the asana (yoga posture), pranayama (breathing technique) and Samadhi. When the student practices the asana or pranayama they may only consider that the asana makes the body stronger, but actually the asana and pranayama also help them to clear blocked energy and activate the chakras. Reiki is also used to clear blocked energy and develop the chakras, so Reiki and yoga are similar in that they are both used to reach a higher vibrational state. 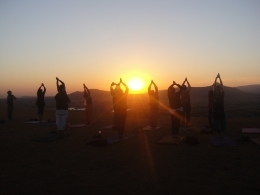 You recently went on a trip to India to further develop your skills as a yoga teacher. Can you tell us a little bit about your trip to India and why you were intrigued to join the course? My personal interest in yoga is that I believe that yoga techniques should benefit people beyond just being exercises for good health. People who have stiff bodies, diseases or are elderly can practice yoga because it’s not only for flexibility or to develop stronger muscle, but to enhance life. I want to teach classes that are tailor-made, with the practice designed especially to address people’s specific problems. This is why I decided to join the Yoga Therapy course with Yoga Vidhya Yogurukul in Nashik for 2 months, in order to go more deeply into yoga. In this course they teach about common disease symptoms, how yoga can heal each disease and knowledge about natural healing, e.g. naturopathy and ayurveda. So for example if you have a problem with migraines or headaches, in addition to the asana you can use pranayama, yoga nidra, mantra chanting etc. to heal the illness. After the course I joined the internship in the therapy center, where they use yoga techniques combined with natural treatments to heal patients. This was an amazing experience, and was very interesting for me to see the results and feedback of the patients’ progress in such a short period of time. During your trip you also joined the Yoga for Pregnancy training. Tell us more about this. Yoga for Pregnancy teaches about how to design the yoga asana for pregnant women to make their body prepared for giving birth, and to reduce pain in some parts of the body, such as the waist and lower back. We can introduce gentle yoga for them, and can adjust the asana specifically to suit them. For example, a pregnant woman can practice the sun salutation just as other practitioners, but in a different way and more gently than normal. During your training you had the opportunity to meet many foreigners. How was it for you to train with people from so many different backgrounds and cultures? In the class there were people from 32 countries with different backgrounds, but what we all had in common was that we know yoga is good for health. It was a good experience to meet so many people as we were able to share knowledge and experience, from different backgrounds ranging from physiology to psychology to acupuncture, and each professional had perspectives of how they can incorporate their work with the knowledge gained in Yoga Therapy. Taking part in this course was a great opportunity for me because the teachers are doctors and professionals in the health industry, so we were able to gain knowledge about disease and healing in a practical way. It sounds like you’ve had a very intriguing learning experience. So how have you been using your experiences in India to develop your yoga teaching since your return to Thailand? I’m now delivering my newfound knowledge into my classes by teaching Yoga Therapy. The first program I’ve created is Yoga Therapy for Office Syndrome, a 10-session program designed to aid healing in people who have problems relating to working in the office, such as back pain, headaches and stress, etc. I work with individuals or small groups with a maximum of 3 people who are suffering from the same problem. I keep the groups small because it’s easier to focus and follow up the individual’s progress. After the 10 sessions, the individual can then continue their progress by practicing at home, or if they prefer they can join a class for the Office Syndrome program again. The Office Syndrome program is a good choice for patients who want to move their body but have not found the right exercises, as we use easy exercises during the class, listening closely to the body’s feedback and adjusting the technique to suit the specific needs of the individual. I often meet people who don’t want to join a yoga class because their body is very weak or inflexible, so I’d like to challenge them to join this basic yoga class and observe their own development! Will there be more to come? And do you have any last comments to add? The Office Syndrome program is the first program in the Yoga Therapy programs, and I’ll be setting up more programs for other problems and diseases in the future. The Yoga Therapy programs teach how to use the breath in a better way, and as my teacher always says ‘no breath, no life; even if you have a disease, if you keep breathing you will not die’; I couldn’t agree more, so keep breathing! Phan is in Bangkok teaching the Yoga Therapy Office Syndrome program every weekend. To find out more about this program, to join one of her classes, or to learn more about other IAHHS training offered with Phan contact her through the IAHHS. An Exclusive Interview with SIEA Team Leader Mohana Kanah Following on from last month's feature about Transcending Entities and Transmutation, Mohana shares with us her story of how she came to be working in this specialist field. Mohana, when did you first train in Transcending Entities and Transmutation, and how long have you been working as part of the SIEA team? It has been a little over 2 years now since I first did the course, in March of 2011. In terms of working as a professional as part of a team, it must be about a year as the system of payment structures, guarantees and Master, Professional and Apprentice statuses were established firmly about a year ago for the SIEA group to support the team as well as the clients in professional ways. Why does it feel important to you to do this work? I find it important because I understand that spirits are in need of help and guidance as much as humans with physical bodies. Just because the person has passed on doesn't mean that they immediately become all-knowing and fearless of the other side. Based on their religious or community upbringing, people carry their beliefs and fears into the death process. When the lost spirits hang on to the earth plane, this leaves a layer of energy in the atmosphere, making it difficult for pure vibrations and information to reach humanity (like a cloud of smoke). There can be confusion and turmoil based on the fears, earthly attachments of the persons who have died, impacting the people who are still alive as their energy fields mix and mingle. This work is valuable for both the living and the deceased. The deceased do suffer to be on the earth plane, unseen by normal eyes, unable to express yet bound to the earth because of the familiarity of their homes and loved ones, even addictions, guilt and fears of punishment for sins. We also release the curses and energy impregnations on the earth with the work we do. Earth has its own ley lines and energy vortexes just as living beings have chakras and meridians lines. It is important that they are clear and without their own blockages of past traumas to the land, which come about by war, bloodshed, sacrifice rituals or protection methods that have utilized protectors/demonic energies or nature spirits from the lowest of good, leaving behind layers of dark, congested/negative energy impregnating our land. It is indeed extremely rewarding to know that we can be of such service to our beloved mother earth. How long have you been working as a Team Leader and how did you come to take on that role? I became a team leader in October 2012. We were appointed to do a house/land clearing which required 2 masters and 8 other team members. It was a big job that took 6 hours to clear. At that time, Steve was the only SIEA master, so I was told by him to buck up and catch up as a team leader; in other words...I did not have a choice! I can laugh about it now but truth be told, I had known from the beginning since I was a Reiki Master that this was a responsibility that I had taken on even before doing the Transcending Entities and Transmutation course, possibly even before I arrived on earth! When I became a Reiki Master, the client sessions became very intense with many cases of possessions with entities, black magic and voodoo, some connected to other life times too. Some of the sessions were shocking and I had to cope and manage as best as I could. Learning Transcending Entities and Transmutation was absolutely useful for it prepared me and gave me the confidence in knowing what needs to be done. I had times where there were screeching screams, foul language, sinister laughter and contorting bodies. Reiki Masters are definitely advised to learn this course, as this is the level where they will come across such tricky sessions. I also recall vividly after my Reiki level 1 class, I was attending the Psychic Development course (DPA) and Steve had asked me why I wanted to do the course. I told him that I wanted to talk to deceased people. It was because from an earlier age, my childhood best friend had her own brother hanging from a playground rope by accident, to many other friends tragic losses without any last words, to my own father who died in jail without any last words or sight and to the unbearable loss of my husband's older brother who committed suicide in front of a train when he was just 20, to another best friend whose father hung himself, leaving her with guilt and self- blame of how she could have played a role in his death. I had all kinds of people walking into my life with a similar pattern of sudden loss. I wanted to help the deceased as well as the living who were suffering from the loss. Some of these living people could never move on, and were dead inside too. I knew life/my guides were trying to remind me of something that I had to do. People are naturally drawn to tell me about their loss of loved ones or their strange ghost/haunted homes even if they don't know about the nature of my work. I guess it’s stamped in my aura " ghost buster " LOL! When I took the SIEA master role, it was from a real need to be able to guide the pros and apprentices because I saw how dangerous this work can be without proper leadership and a watchful eye. The SIEA Master has to watch out for the team and make sure that everything is taken care of in the clearing, including the safety of the Professionals and Apprentices. There have been many instances where a team member can get stuck with some energy or entity that is very detrimental to their life energy and well being. I also love giving out information to help new students be educated in working with energy in proper ways so that they do not get into trouble carelessly. Energy healing of people and spaces sounds fun and easy, but it is indeed a big responsibility and needs to be done right. It is a very serious job and not to be taken lightly under any circumstances by those who do not have plenty of experiences in that field. We have seen people get really sick without proper guidance and training. What are the most frequent benefits people who have had their space cleared by a SIEA team tell you about afterwards? After a clearing, the feedback from the people living in the space that has been cleared is that they have greater feelings of peace, more laughter and harmony, less quarrels amongst family members, more frequent family times in the spaces where normally no one likes to gather together, better relationships with partners, better sleep and no more feelings of being watched and being creeped-out with chills. Most clients normally wonder why they didn't do it earlier! To find out more about the SIEA group and/or receiving a visit from the SIEA team, or to learn about the Transcending Entities and Transmutation course offered exclusively by the IAHHS, visit the SIEA website. Living the Dream For those of you who have known Siam Reiki Founder Steve Burgess for a while, you will know that - amongst many other projects - for some time now he has held a vision to create an opportunity in Thailand for Siam Reiki research. Well, that vision has now realized itself with the recent construction of the Reiki Shack, in Ubon Ratchathani. This past week research has been underway as a team of 10 Siam Reiki practitioners perform treatments on 10 participants from the local area, for seven consecutive days. Frequency Equipment is being used to quantify the effectiveness of Siam Reiki, with the purpose of identifying how Reiki works on the physical body, and to observe the differences in results when treatments are received from practitioners with different levels in Siam Reiki. To see more pictures and to stay updated about progress at the Reiki Shack, join the Siam Reiki facebook page. And of course remember to keep an eye out in future mailouts to find out the results of this recent research!